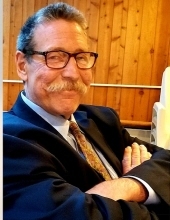 SMITH – James Glaeser Smith, 57, passed away peacefully at his home on Thursday, January 24, 2018 after a courageous battle with cancer. He was the loving husband and companion of Patricia McGreal for 25 years. Born February 7, 1961 in Tarrytown, NY; the son of the late Ronald and Marjorie (Glaeser) Smith. Jimmy, "Bones" spent his school years in Simsbury. He studied culinary while in high school and began working at the One Way Fare for many years. He spent some time in Construction then getting his CDL license. He enjoyed his job working for Spacefitters, driving the semi throughout the country. He was a hard worker and always willing to lend a helping hand. He loved taking the motorcycles out with his wife, swimming and taking the boat out on Lake McDonough with his family, always making sure to be the first to jump in for the season,even if it was the beginning of March. In the summer you could always find him grilling up something delicious, a beer in one hand and a grill fork in the other. The Music of the Grateful Dead playing. He enjoyed many a show, thoroughly enjoying himself, at the shows and in life in general. He was an avid skier, especially enjoying the out of bounds at Smuggs .The Patriots and the Yankees were his teams. In addition to his devoted wife, he leaves his children, Danielle Smith Cebron, Benjamin Smith McGreal, Stepchildren, Michael McGreal and Alexandra McGreal. Danielle's Husband, Joe Cebron. Grandchildren, Emilee, Julian and Natalie. Step mom, Roxanna; brother, Kenny, wife susan; sisters, Susan and husband Eckhart and Jennifer and husband Luke; and several nieces and nephews. Let our past conversations and experiences we enjoyed with Jimmy, " Bones" bring us laughter and comfort at this sad time. Per Jim's request there will be no formal services held. .A celebration of his life will be held at a later date. Montano-Shea Funeral Home, 5 Steele Road, New Hartford has care of the arrangements. Visit an online guestbook at Montano-shea.com. Fare you well, fare you well, I love you more than words can tell. Listen to the river sing sweet songs to rock my soul. To plant a tree in memory of James Glaeser Smith, please visit our Tribute Store. "Email Address" would like to share the life celebration of James Glaeser Smith. Click on the "link" to go to share a favorite memory or leave a condolence message for the family.